The new iPad is now in the hands of 3 million owners and counting, and accessory makers are getting up to speed with products for Apple's latest tablet. Here are the new iPad products we've seen this week, along with a couple of other iOS accessories. Adroitly: To be honest, this company's $25 Crazy Cradle stand for iPad seems less crazy and more, well, sensible. 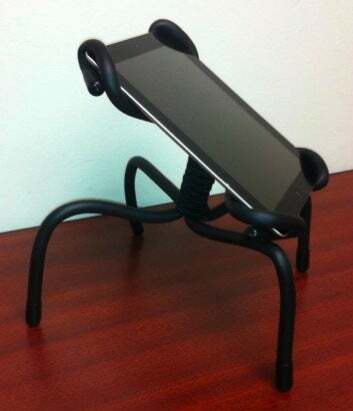 The stand has flexible legs that can be bent to wrap around other objects, so in addition to propping up your iPad on a tabletop, you can attach your tablet to a door, car seat, bicycle handlebar, or even a shopping cart to guide your journey or provide a distraction when needed. The Crazy Cradle comes in black or blue. 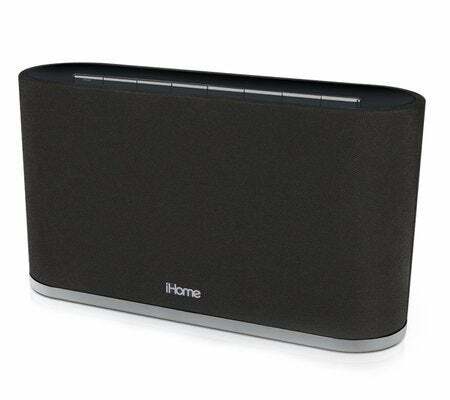 iHome: Still looking for the perfect system to wirelessly play music directly from your iPad or iPhone to a great speaker system? iHome's $200 iW2 speaker system might fill the need. It uses iOS's AirPlay capabilities to let users stream and control their music over a Wi-Fi network, although it also lets you dock an iPhone or iPad, and it includes an aux-in jack to play music from other devices. The iW2 works with the free iHome Set and iHome Connect apps on your iOS device. 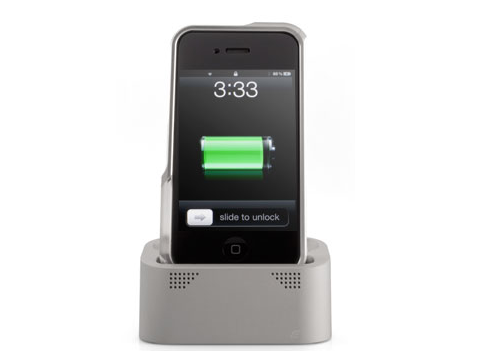 Element Case: The $120 Vapor Dock is a luxury charging and syncing dock for the iPhone and iPod touch that's CNC-machined from a single, solid billet of aluminum. The device comes in either a satin-silver or -black finish; it includes a USB-to-dock-connector cable that fits inside the cable-management pocket in the base, and it features an audio-enhancement port that claims to amplify the sound from your iPhone or iPod's own speakers. The raised dock connector and wide dock cradle lets you use the Vapor Dock with many cases, and rubberized feet prevent the Vapor Dock from sliding around your desk. Kensington: Do you have a new iPad? 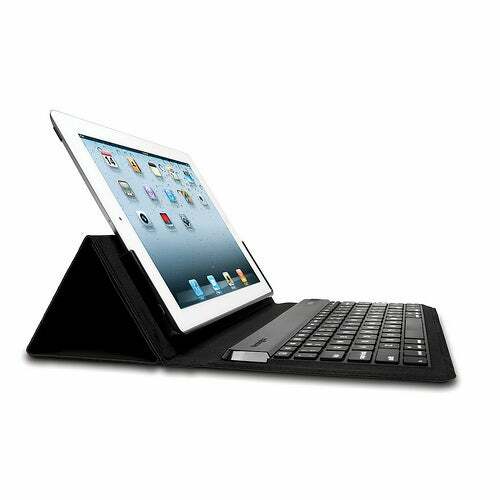 You might want to look at Kensington's new line of keyboard cases designed for the latest-generation Apple tablet. They include the $80 KeyStand Compact Keyboard & Stand, the $100 KeyFolio Keyboard Case, and the $110 KeyFolio Expert Multi Angle Folio & Keyboard. The KeyStand provides a simple support for leaning your iPad back during use. The KeyFolio devices hold your tablet in place using either a custom-fit frame (the Keyboard Case) or "micro suction technology" (the Expert). Each sports a Bluetooth keyboards to put your new tablet to productive use, and each is currently available for pre-order. Padacs: This Australia-based accessory maker is updating its Rubata line of keyboard cases to complement the new iPad. The $60 Rubata 3 is a hardshell case with a Bluetooth keyboard; the case is meant to fit the contours of the new tablet, but also represents an upgrade over the Rubata 2 because of an updated chipset to lengthen the keyboard battery life. The Rubata 3 starts shipping in April. USBFever: We've seen a good number of products that make your new iPhone look old, and USBFever's $100 iRetroPhone with SyncCharger now joins that list. 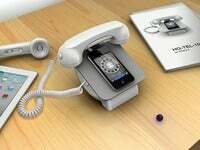 The device cradles your phone in a dock connected to an old-school telephone handset—complete with curly telephone wire! (No word on whether or not the cord gets all knotted up for authenticity.) Use the accessory in conjunction with the iRetroPhone app, and you can use your iPhone as a rotary dialer for the device. Everything old is new again.